Sometimes you want a treat, but don’t feel like taking the time to make something or don’t want a mess in the kitchen with a bunch of dishes to clean. Am I right? Luckily, this tasty, fuss-free raw apple pear crisp comes together in minutes and is quite satisfying. Additionally, all these ingredients are things I had on hand in my kitchen — no running to the store to pick up anything. Feel free to use any type of apple or pear that you like. I personally like the granny smith in this dish because it doesn’t add any additional sweetness, yet the tartness mellows out a bit. The Asian pear is nice because it has more of a crispness than other pears and is also a little less sweet. As for the crumb topping, it’s so good that I could probably eat spoonfuls of it all by itself. If you like, you can also add nutmeg, cloves or allspice to the mix. Cardamom would also be tasty, especially with the pear. 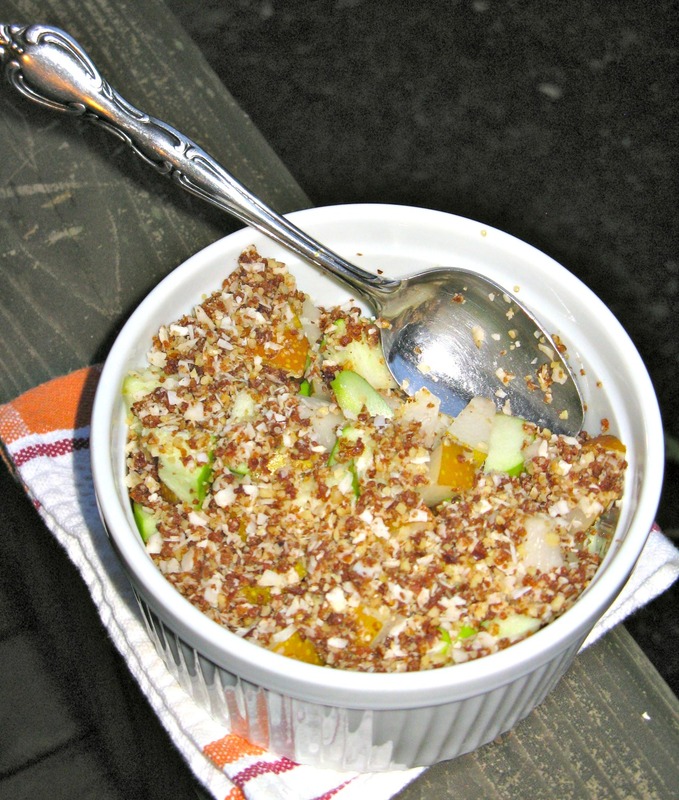 Toss the chopped apple and pear together in a large bowl with the citrus juice. Add in raw honey, if using. Scoop apples into a medium-sized bowl or dish and set aside. To your food processor, add the walnuts, coconut flakes, dates, spices and sea salt. Process until the mixture is crumbly and there are no large chunks. If desired, add more cinnamon and ginger. Scoop crumb mixture over top of apples and serve.